2015 marks the fourth year of the Health Hero Challenge, a social-media-based program where Be Well Philly searches for the region’s champions of health and wellness. The Challenge launched in June with a call for nominations for Health Heroes: coaches, teachers, doctors, nonprofit founders — anyone who’s truly helping others make strides for healthier lives. Then, we selected 16 semifinalists who will face off in a social community bracketology-style contest until we get to the Final Four. In the final two-week round, voting and social engagement will surge as supporters advocate for their Health Hero to win. The winner will be announced and honored at an amazing event in November, where all finalists will be joined by their advocates in an inspirational celebration of everything they do.  On December 3rd, Philadelphia magazine and Independence Blue Cross celebrated Be Well Philly’s 3rd annual Health Hero Challenge by recognizing Pia Martin as the 2014 winner. Pia is a health and physical education teacher at Science Leadership Academy, a partnership high school between the School District of Philadelphia and the Franklin Institute. $3,000 was awarded to the Science Leadership Academy’s Home & School Association on her behalf, and three runners-up received $250 each for their respective charities. Leslie Marant, owner of Temple Building Fitness, and co-ambassador at Black Girls Run Philadelphia, an organization that encourages African-American women to make fitness and healthy living a priority, was crowned the 2013 Health Hero. Philadelphia magazine awarded $3,000 to the Organization of Autism Research (OAR) on behalf of Leslie, and three runners-up received $250 each for their respective charities. Beth DuPree, MD, breast surgeon and medical director of the Breast Health Program at Holy Redeemer Health System, was crowned the 2012 Health Hero. Philadelphia magazine awarded $2,500 to The Healing Consciousness Foundation, a charity founded by Dr. DuPree which works to improve the quality of life for breast cancer patients through holistic approaches, lifestyle changes and education, while three runners-up each went home with $250 for the charities of their choice.